Touch International’s Projected Capacitive Demo Kits are a smart way for OEMs and system engineers to test-drive our technology and streamline the product development process. By purchasing a touch screen demo, you can not only obtain a better grasp for the touch screen performance but also begin software development and system testing. Our kits are designed to be easily disassembled for those wanting to start testing integration. To complete the package, we’ve optically bonded the touch panel to a sunlight readable display. The 7″ version is capable of up to 2000cd/m2. To drive the super bright LED’s and make testing easy, our custom video driver boards only need (1) 12-volt power source and a VGA cable, which comes with your kit. To further jumpstart your testing, you’ll also receive testing and demo software specifically for evaluating touch panel performance. 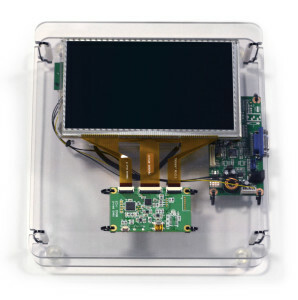 Whether your project requires enhanced optics, advanced functionality or multi-touch capabilities, our touch screen demo kits are an extremely cost-effective way to get from concept to production. Talk to a Touch International sales rep about ordering your demo today! Why Start With a Touch Screen Demo? Our new line of Projected Capacitive Touch Demo Kits features our latest capacitive sensor designs with lightning fast performance optically bonded to a superbright, sunlight readable display. All displays have VGA input and USB touch controller for easy plug-and-play operation. All cables and a power supply are included along with GestureWorks and Nuiteq Snowflake touch demo software. Demo Kit Customization will affect lead time. Please contact your sales representative to inquire. © Touch International, Inc. All rights reserved.